MUST SEE! This Exquisite home is located in an Award Winning Resort-Style Community of BellaLago. No need to go on vacation with this community as it features Multi-Million dollar club house with Olympic size pools, aquatic center, water park, tennis courts, volley ball and basket ball courts, boating ramp to lake Toho, fishing piers, bike trailing or walking trails, fitness centers with Yoga instructors, Martial arts, Salsa classes too much to mention. Call it a Staycation from home. This beautiful property has architectural designs throughout with high ceilings including some tray ceilings, 8 foot doors providing a sense of spaciousness with an open floor plan. Flex room that can be used as a bedroom or a study room. Kitchen with granite counter tops, stainless steel appliances with maple cabinets with mocha glazed and crown moldings with rope details. Laundry room with stainless steel washer and dryer. This home was for snowbirds thus barely used and remains freshly painted with recently installed window shutters throughout. 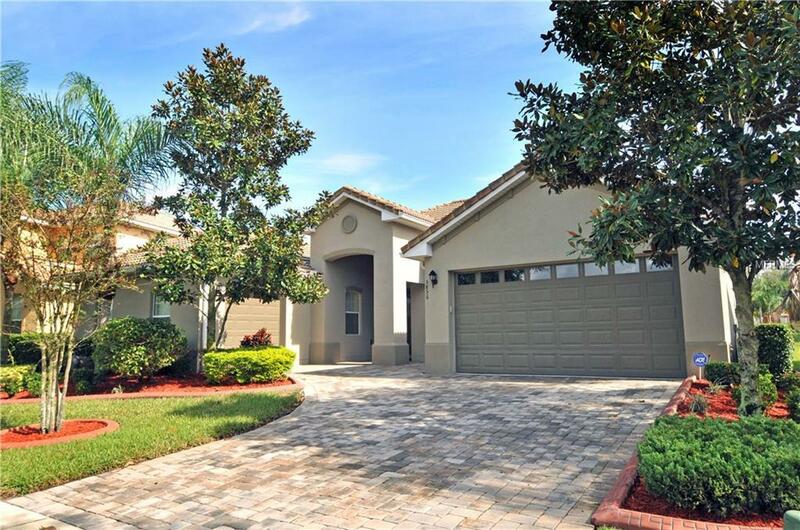 Near all including shopping centers and less than 30 minutes away from World Disney. Be ready to have your family vacationing at this home. it is also properly located between newly construction homes with higher prices thus higher appreciation value. A truly must see home.